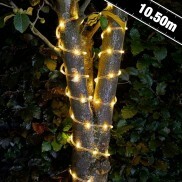 Enjoy stunning warm white lighting in your garden with solar powered rope light with flash and static light functions. 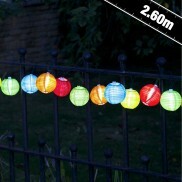 Hang solar Chinese lantern string lights in your garden for a splash of colour and instant uplifting atmosphere. 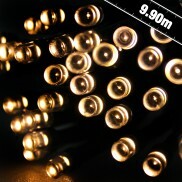 With static and flash functions, these stylish warm white fairy light bulbs make a stunning feature in your garden. 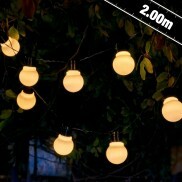 Add a little magic to your garden with warm white clear capped festoon lights that are solar powered! 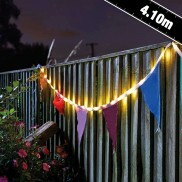 Create a playful party atmosphere in your garden with colourful bunting lit by warm white fairy lights! 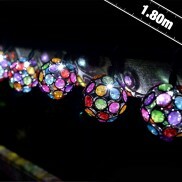 Bohemian garden lighting that's colourful and decorative, solar multi glow gem string lights project colourful light into your garden. 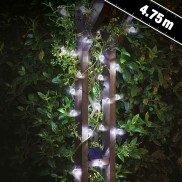 Trim your garden with pretty white roses lit with white LED's for magical garden lighting. 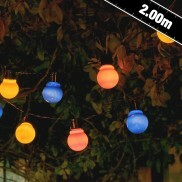 Stylish colour lighting for your garden, these solar hanging light bulbs are ideal for parties and patios! 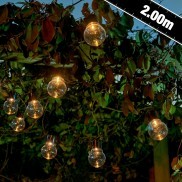 Add ambience and colour to your patios, gazebos or party tents with elegant Rattan Solar Balls. 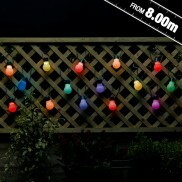 Enjoy carnival style and colourful feature lighting night after night with solar powered festoon lights. 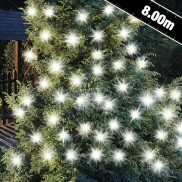 Add sparkle to your garden with beautiful solar powered stars that have both constant and flashing functions. 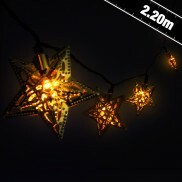 Transform your garden into a starry, starry night with solar metal star string lights. 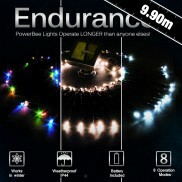 Designed to work all year round in the UK, manufactured with the best components combined with a patented technology! 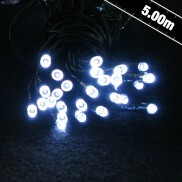 Solar powered colour-changing string lights are ideal for decorating your garden in a fun and attractive way. 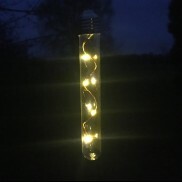 A vintage industrial look for your garden, this stylish hanging light tube is lit by warm white fairy lights. 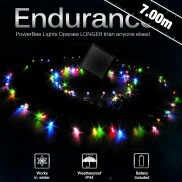 Endurance ® Colour Changing Solar Fairy Lights with 50 super bright LEDs, are designed to work ALL YEAR ROUND in the UK. Ideal for parties, porches, pergolas and much more. 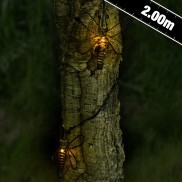 This set of 10 Solar Metal Dragonfly Lights will look great strung across your garden, illuminating at night with a choice of static or flashing light. 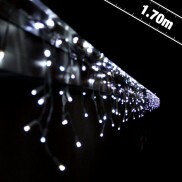 Solar lights that actually work in winter too for beautiful festive displays despite the weather! 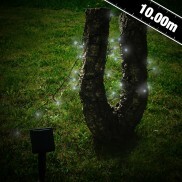 Brighten up the darkest depths of your garden with magical twinkling light from 100 white LED solar lights. 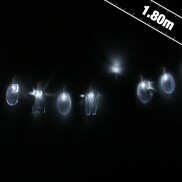 Perfect for parties, spell out messages and see them in lights with solar powered alphabet lights! 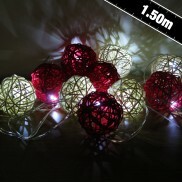 Magical multi faceted orbs shine ultra bright light into your garden night after night for pure enchantment! 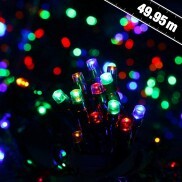 Perfect for parties, entertaining, relaxing and more, these multi coloured LED string lights add a splash of colour to your garden with a whopping 49.95m of illumination! 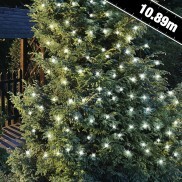 Light your garden with the beautiful glow of solar powered LED lighting. 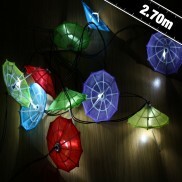 Bright and cheerful solar lighting, colourful umbrellas illuminate your garden with a bright white glow. 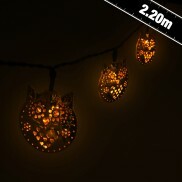 12 adorable filigree owl lights add sparkle and shine to your garden with a warm white glow. 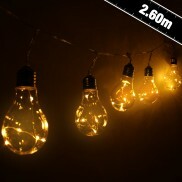 Brighten up your garden with solar powered string lighting that sets off your garden beautifully. Use decorative string lights to animate key features such as trees, bushes and trellis’ creating an oasis of calm and beauty. 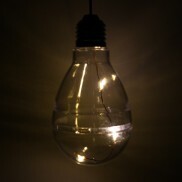 Take the vintage lighting look into your garden with decorative clear bulbs lit by fairy lights! 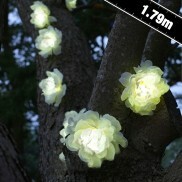 Garden lighting doesn't come more magical than this. 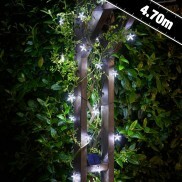 Light up key features in your garden with solar powered LED string lights that can be set to static, twinkling or flashing and create a captivating effect. 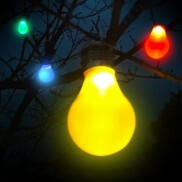 Classic white festoon garden lights that are solar powered for easy placement and atmospheric lighting night after night.